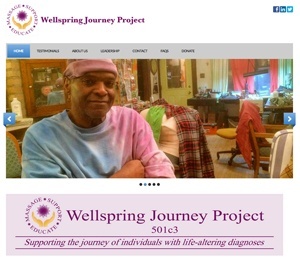 We want to wish a very appreciative WELCOME to Wellspring Journey Project, a non-profit agency which provides massage therapy to individuals facing life-altering illness and their caregivers. What a compassionate and soul-healing service they provide! Blue’s ArtHouse is proud to now be maintaining their website. We spruced it up a little bit and will eventually donate a full redesign to this amazing organization.